BC Khimki Moscow Region sent a message that echoed all around Top 16 Group F by thrashing Maccabi Electra Tel Aviv 88-67 at home on Friday. 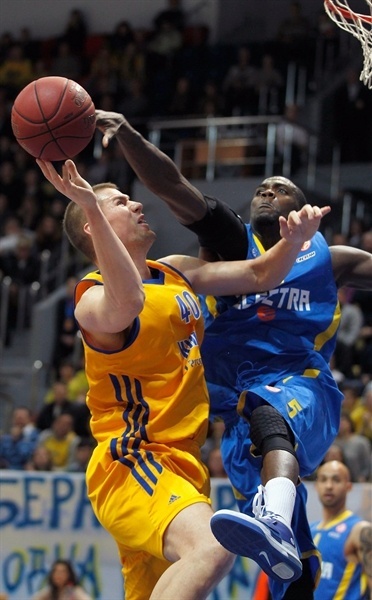 Khimki improved to 3-1 and remained undefeated at home this season. Maccabi dropped to 1-3 and is two wins away from playoff territory. K.C. Rivers paced the winners with 20 points. 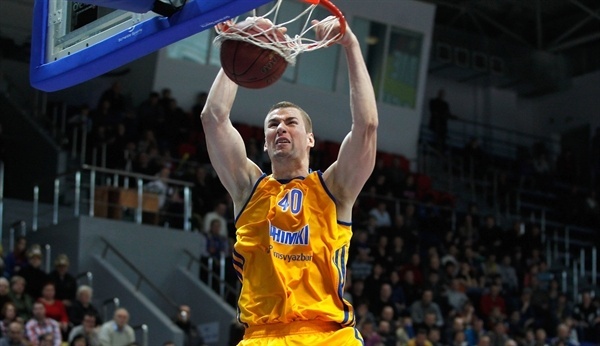 Paul Davis added 16 points, 9 rebounds and 5 blocks, while Petteri Koponen had 15 points for Khimki. 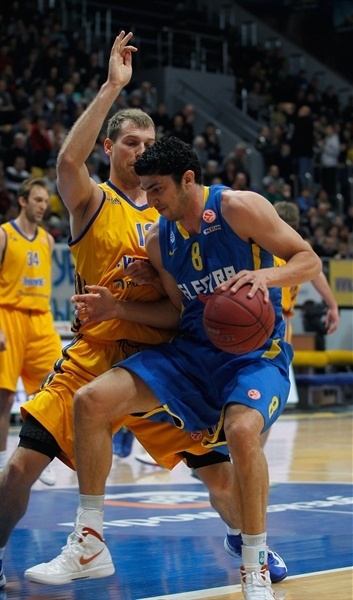 Lior Eliyahu led Maccabi with 17 points. Shawn James added 15 and Devin Smith 12 for the Israeli champs. Smith scored 10 first-quarter points and got plenty of help from Eliyahu to give Maccabi a 19-25 lead after 10 minutes. Khimki improved its defense early in the second quarter and found go-to guys in Fridzon and Davis, who led a game-changing 16-0 run that made it a double-digit game, 40-29. Three-pointers by Koponen and Rivers boosted the hosts' lead to 46-34 at halftime. Nothing changed after the break, as Khimki improved its margin to 70-50 after 30 minutes and cruised to a well-deserved win. Lior Eliyahu got Maccabi going with his trademark one-handed push shot in the lane. 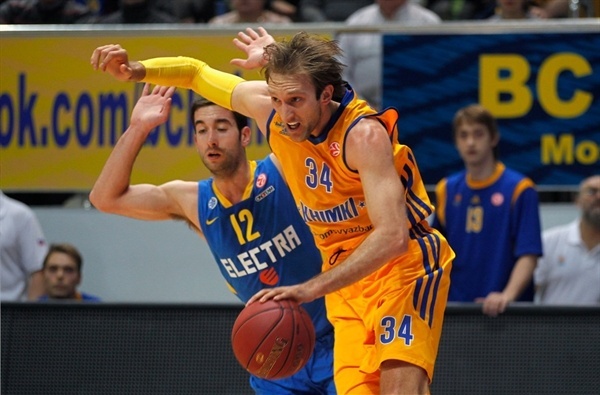 Kresimir Loncar downed a four-meter jumper and Zoran Planinic soon gave Khimki its first lead, 4-2. Eliyahu buried another close shot, but Egor Vyaltsev beat the shot clock with a put-back layup. 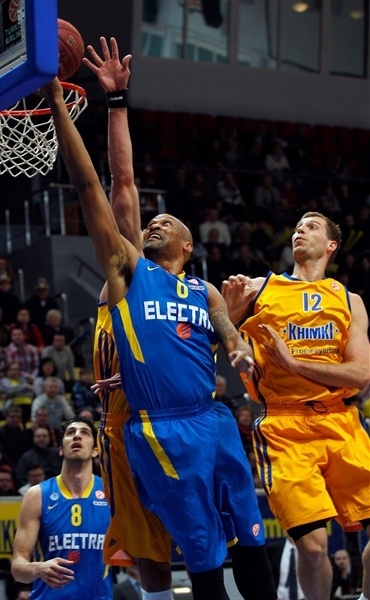 Devin Smith struck from downtown and matched Zoran Planinic's layup with a four-meter jumper for an 8-9 Maccabi edge. Smith added a three from the corner, but a jumper by Loncar kept the hosts within 10-12. Eliyahu took over with a reverse layup and fed Smith for a fast break basket that caused Khimki to stop the game at 10-16. 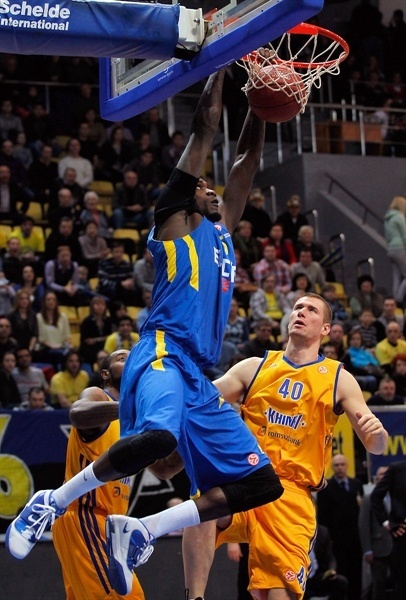 Vyaltsev scored in penetration, Shawn James shocked the crowd with a put-back slam and a layup by K.C. Rivers gave the hosts some hope at 14-18. Eliyahu and Ricky Hickman stepped up with back-to-back baskets, Vyaltsev and David Logan traded triples and a backdoor layup by Vitaly Fridzon kept Khimki within 19-25 after 10 minutes. James banked in a close shot early in the second quarter but Sergey Monya matched it with a high-flying tip-in and Fridzon took over with a layup-plus-foul that brought Khimki a bit closer, 24-27. Eliyahu scored again, but Paul Davis did betted with a three-point play. Maccabi struggled to score, while Fridzon and an unstoppable Davis completed the hosts' comeback, 31-29. 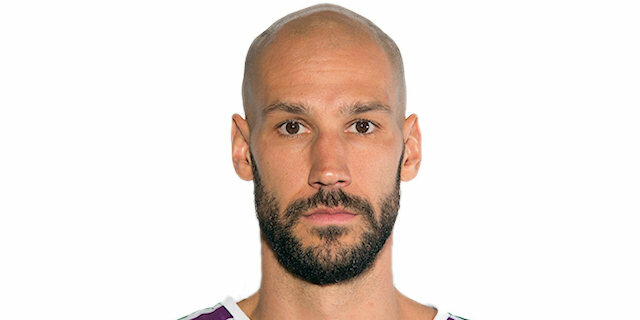 Petteri Koponen nailed a baseline jumper and Fridzon buried a catch-and-shoot three-pointer in transition that ignited the crowd. 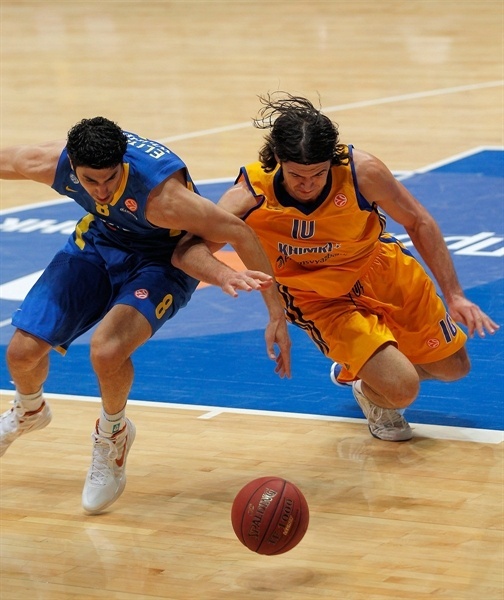 Maccabi was held scoreless for more than six minutes. Davis sank a turnaround jumper and Koponen buried another five-meter shot which capped a 16-0 run and forced Maccabi to call timeout at 40-29. Hickman tried to change things with a three-point play and Yogev Oyahon made free throws, but Koponen and Rivers answered from downtown to boost Khimki's lead to 46-34 at halftime. Eliyahu nailed a running hook immediately after the break and matched Koponen's baseline jumper with free throws. Loncar hit foul shots, but a three-point play by an unstoppable Eliyahu brought Maccabi within single digits, 50-41. 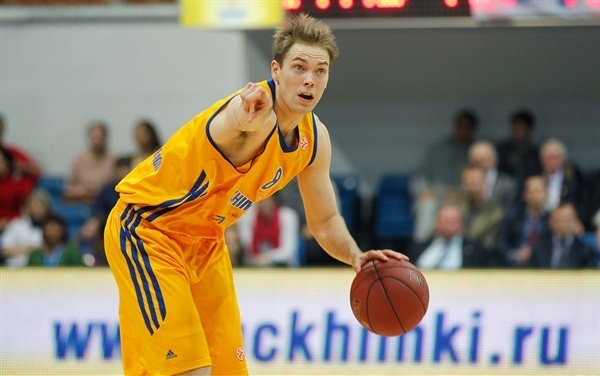 Koponen swished a mid-range jumper and Vyaltsev copied him right after that to keep Khimki out of trouble. Maccabi tried to use shorter possessions, but the shots did not fall in. Meanwhile, an easy basket by Davis made it a 15-point game. Ohayon shined with an acrobatic layup and Darko Planinic scored around the basket, but Davis and Koponen erased that with free throws. James Augustine and Eliyahu traded layups, but Rivers and Davis soon broke the game open, 66-47. Nik Caner-Medley buried a three-pointer, Augustine scored in transition and free throws by Rivers gave Khimki a 20-point lead, 70-50, through three quarters. 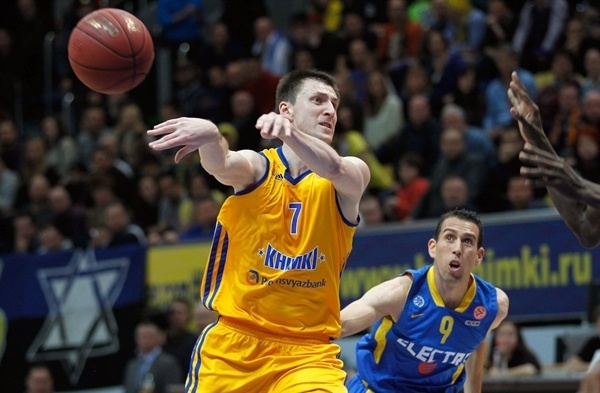 Rivers scored around the basket early in fourth quarter, as Maccabi kept struggling to score. A huge dunk by Davis essentially sealed the outcome, 74-50, right after that. Maccabi called a much-needed timeout, but could not find the way to the basket against Khimki's outstanding man-to-man defense. Hickman tried to change things with a two-handed dunk, as Khimki started to use longer possessions to run the game clock down. Rivers finished one of those with a three-pointer and even after Smith swished a mid-range jumper and James scored down low, everything was said and done already. The Khimki fans had plenty of time to celebrate a historic win and see their team get closer to the playoffs. "I’m very happy for the job we did today on the court, with concentration for 40 minutes. Frankly speaking I didn’t expect that we would manage to come together in such a perfect way. This game was even better than the game against FC Barcelona Regal, it was a high-quality basketball with energy and intensity. Very seldom I’m pleased with the way my guys play, but today I have no grievance against my players, no claims. We surpassed Maccabi Electra at all parameters. To cut a long story short, the game was great. 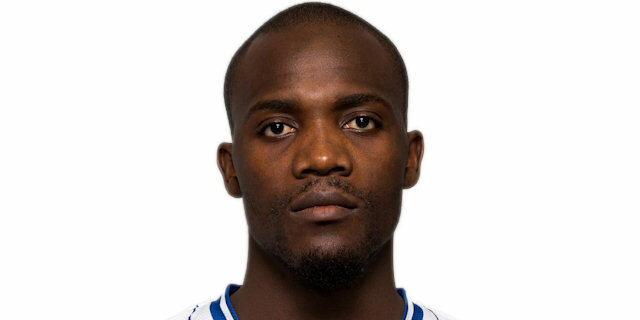 Now you see that it was like a message to the Turkish Airlines Euroleague, that BC Khimki is not an accidental team." "First of all, congratulations to BC Khimki. They really played a good game. After the first quarter we lost our way. You can make plans in the best possible way, but the moment that you don’t stay true to the principles, you get in trouble against good teams and that’s what happened today. We played a very good first quarter, and then we simply stopped. 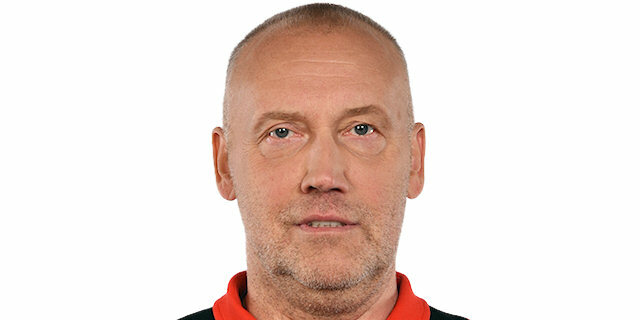 It was very difficult for me to look on the floor and see a lot of my great players from the national team, from the past. It’s a funny feeling and to be honest an unpleasant one, especially today, because they won. I’m happy to see Fridzon continuing his great career and Monya to be such a successful player and a leader. It’s great to see Vyaltsev playing a major role in a high-level team; he is a national team level player." 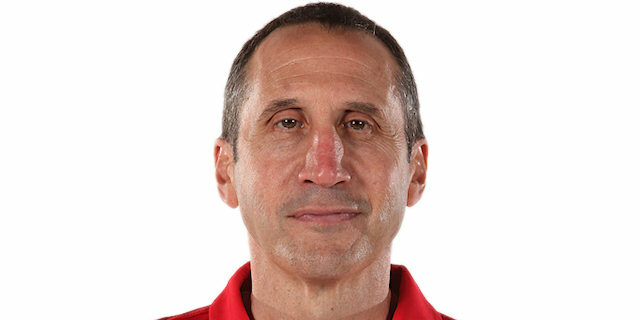 "It was a great game for our team; we played very good defense in the second half after a constrained start. The team came together and scored a very important home victory. In the first quarter we got stuck, lost a lot of defense principles, it was a slow beginning. Our bench played an incredible game and everyone contributed today. At the same time I don’t think it was an easy victory, despite us winning by a lot of points. The reason we won is our defense." "We didn’t do our job today. We made a lot of turnovers in the second quarter. 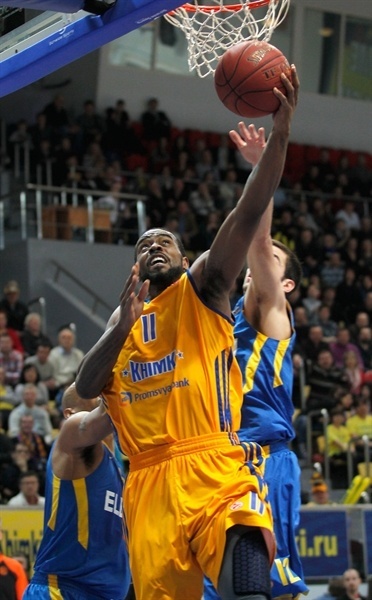 We started the game pretty well, but had too many turnovers and Khimki had too many second-chance opportunities."